I have been struggling with a problem…a curtain problem to be exact. I have bought countless curtain panels, and just haven’t been satisfied with any of them. I did have one set that I loved, but the color was a little off, so they went to live in my bedroom. I finally decided that it was time to make my own easy sew curtain panels. I have made my own curtains many times before, but I wanted these to be special…they needed to be just right. I scoured the fabric stores here, and just couldn’t find what I was looking for…something with aqua, green, and flowers…but not too many flowers. I finally decided to look online, and found just what I wanted at OnlineFabricStore.net! I fell in love with the Swavelle / Mill Creek Lundsford Opal Fabric immediately…it was everything I was looking for and more! 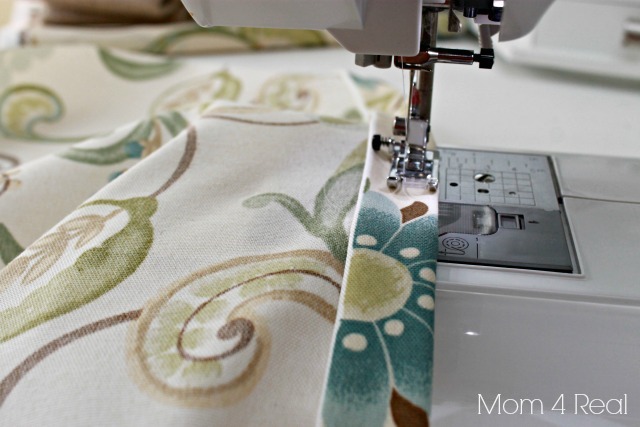 Let me show you how easy it was to turn this beautiful fabric into two curtain panels. First I measured from where my curtain rod would hang all the way to the floor. I added 4 inches to the top and 2 inches to the bottom and cut my fabric. It’s up to you how wide you want them to be. Mine will stay open, but if you want yours pull closed, you will need to measure for that as well. I kept mine at around 3 feet in width. Before getting to the end, I made sure to fold in the next side so when I sewed around the edge, it would be nice and clean. I continued until I had sewn the seam around all four sides of my panel. The last thing I did was sew my curtain rod pocket. I made sure to find the top of the panel and folded it over about 3 inches. I then sewed down the seam I had originally sewn for the edge. That’s it!!! I hung my panels, and could not have been happier! They were just what I wanted…simple, with an impact! I had ordered my fabric, and it came a few days before I left for Haven Conference. I was so excited to get home and make my curtains, but I am sooo glad I waited! The awesome ladies from OFS were at Haven Conference, and gave us a little swag! Mine just happened to be the perfect match to my fabric that was waiting at home! As soon as I got home, I shared the above photo on instagram. And let me tell you…the marriage of these fabrics did not dissapoint…check out how stinkin cute these Stenciled Burlap and Chevron Pillows turned out!!! Now on to the good part…OnlineFabricStore.net is allowing me to give one of you a $50 credit to their shop!!! Enter using the Rafflecopter below! Sharing at Remodelaholic and Savvy Southern Style! « 5 Ideas for Planting Succulents at Home! Jessica!!! I just love that curtain fabric. Your living room looks absolutely adorable. I love online fabric. I bought some cute fabric to make a sun dress and never did….lol But, I’ve been eyeing up the Waverly Pom Pom for my craft room makeover. There isn’t a raffle copter in the post. Love the fabric! It just popped up. The fabric you picked is perfect for my bedroom. That would be my choice. 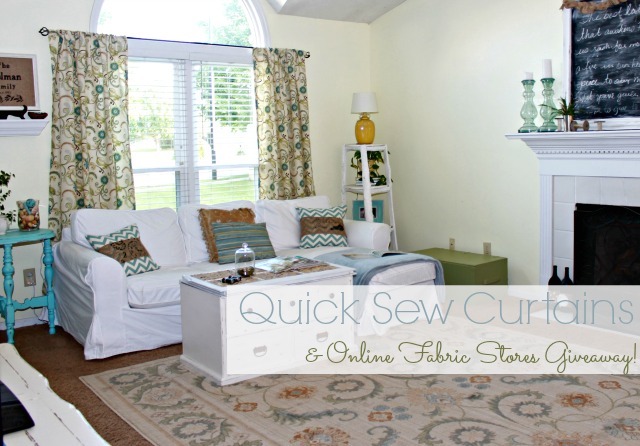 Love you curtains – love the riviera kiwi linen fabric in their store. I love everything Waverly. My fave is: Waverly Whim Sun N Shade Mist Fabric. The curtains are PERFECT for your room! Love that fabric! I love the Covington Denim Blue stripe fabric. I think it would work perfect for a project in my daughter’s room!! Thank you for this opportunity. Your curtains look great! Oh my, that was like trying to pick one piece of candy from a candy store! I really like Covington Topsy Turvy Toile Fabric. But, given another hour I am sure I could find a few others to love too! Ok you made this look easy. I guess I might need to dust off my sewing machine because I have a guest room that needs some curtains! The turtle shell is a fun pattern! I love the fabric you picked. It would go perfectly in y guest/sewing room. My fav is probably Amy Butler’s Fresh Poppies http://www.onlinefabricstore.net/quilting/quilting-fabric/amy-butler-fabric/amy-butler-fresh-poppies-linen-fabric-.htm I mean that grey, pink and green??? Too die for!! Soooo many choices. I think I like the Waverly Fun Floret Citrus Orange. I would recover my dining room chairs. Your curtains turned out great. Love this fabric! Would go perfectly in my living room as well. I was waiting for you to post the name of it after you showed it on the blog last week. I might have to order the same! My bedroom windows have been bare, except for the wood blinds, for awhile now. I haven’t been able to find fabric that I like either. I’m off to see what Online Fabric Store might have and start my wish list! Thank you both for the chance to win some free fabric. I love the HGTV Turtle Shell Turquoise! I love the fabric you used!! The Swavelle / Mill Creek Lundsford Opal Fabric is just perfect! All the chevrons, damasks and dots in the premier prints line. I use them to make my bags in my store – luv em!! I LOVE onlinefabricstore! That is my favorite. I was ordering from another one and they would always take forever to ship and then they would tell me some of my fabric was no longer in stock once I paid! I found OFS and I love them. They are VERY reasonable and have all the latest fashionable fabrics and ship very fast! I am in love with my fabric too from Haven! Mine also matched my house decor colors, crazy! I’ve got drapes to make and then I’m starting on a project using my OLFS fabric. Thanks for sharing your ideas. I think your pillow turned out FAB! Love the fabrics! This would be a great opportunity for me to make my own curtains! So much to choose from ..! but my favorite fabric, as of right now, has go to be the Premier Prints Zig Zag Candy Pink Twill <3 I've been working around that pattern, and color, for my daughter's first room ! Great easy fix to curtain problems! I just started using onlinefabricstore.net when one of my clients needed to find the perfect fabric for her nursery set! We fell in LOVE with the Premier Prints Gotcha Blue Twill! I searched the web for it and decided that this was the best deal! I am so excited to share the site, so my clients can hand pick what they want without the plain options at the local fabric store! Thanks again for this great idea. I love the mix of colors and textures. Very creative! I love Premier Prints!! One of my other favorites right now is Waverly Santa Maria Desert Flower. It’s hard to narrow it down to just one, but I really like the Premier Prints Outdoor Twirly Greenage. I love Portfolio Treads and Royale fabrics! I love the Braemore Gorgeous Pearl and of course I always have to have expensive taste at 25.00 a yard. I love the way the swirls in the rug are repeated on the curtains! And I would choose either the black and white or black and linen gingham. Oh my CUTEness! They are perfect. You sew like me… lol. A straight line. I got it. Love the fabric, so pulls the room together, it looks beautiful Jessica!! I too recently made drapery panels for my livingroom using this same fabric and I absolutely love them. I’m currently making shower curtain panels using Premier Prints Fenton Village Blue Natural fabric. After I’m finished with those, I’m considering Richloom Gloria Jubilee fabric for bedroom draperies. I’m a big fan of OnlineFabricStore.net!! Thanks for the chance to win. HGTV Urban Blossoms Platinum – love the new HGTV fabrics! 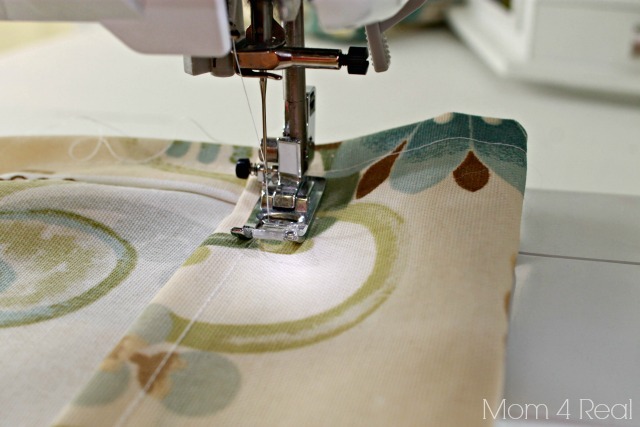 I love the fabric you chose, would also love to try out some oilcloth in a damask or stripe! your room looks so crisp and classy! love the color scheme! I love the selection and the prices are great! The Amy Butler Buttercups Spearmint caught my eye & would be so cute in my daughter’s room! Would love to win this!!! So many to love! Premier Prints Barber Powder Blue Twill Fabric caught my eye- I will have to spend some serious time on their site as I have chairs and windows begging for a redo! I love the HGTV Urban Blossoms Berry Fabric…those fabrics are georgeous! As I am a quilter I love their selection of quilting cottons. My favourite at the moment is Amy Butler Water Bouquet Midnight. Thanks! I learn so many things from your blog. Now I know about this fantastic fabric store – OnlineFabricStore.net. I’m following you and them on FB and Pinterest. Thanks for the info and the chance to win the giveaway. 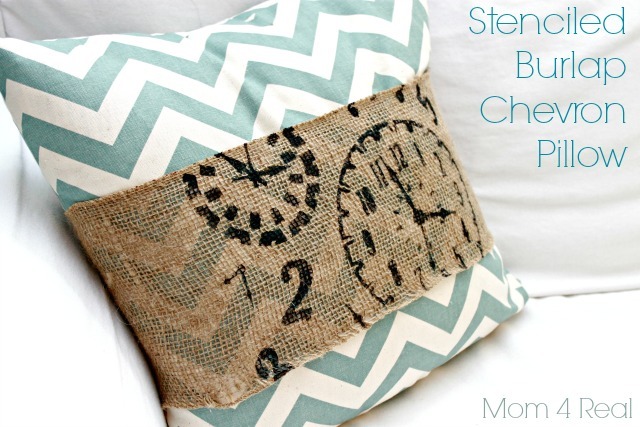 I love the chevron and burlap pillow! Love your curtains and pillow. The fabric is so pretty and really compliment your décor. Thank you for your wonderful tutorials. 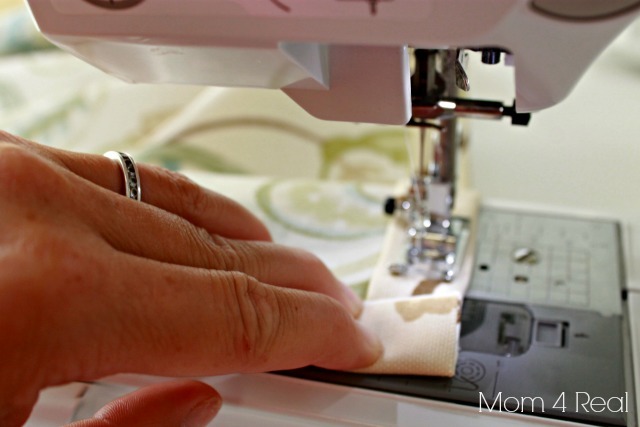 You certainly do make sewing so easy. I love all the fabrics at Online Fabric Store, but I would really like the #8 Natural Cotton Duck Fabric . Its 60″ wide and I am seriously considering slip covering my couch and chair. This fabric I think would be the perfect weight. I am in LOVE with your fabric choices. I always have such a hard time mixing patterns. These look amazing together, great job! I love the Braemore Gazebo Could Fabric!!! 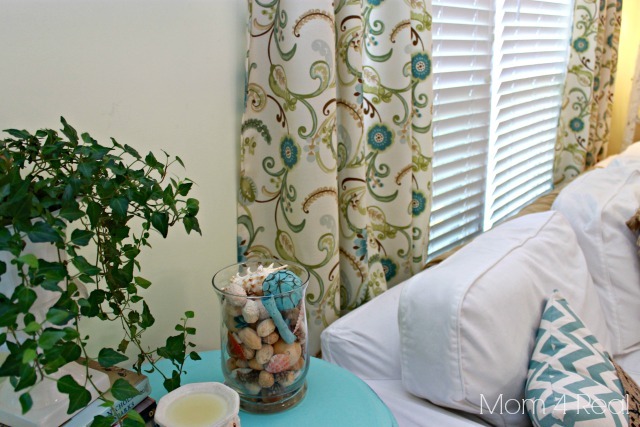 I need new window coverings in ALL rooms….this would be a great start! I love the HGTV flower tower fabric! Oh so pretty! Thanks for the chance to win! I LOVe the orange chevron!!! 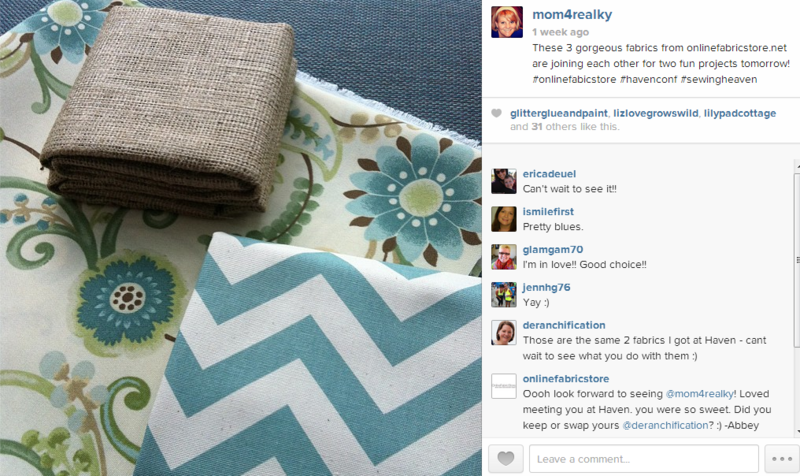 I love the teal chevron you used on your throw pillow with the burlap! I love the premier prints French stamp fabric. It would go great with our travel themed guest room! Thanks for the color inspiration!! These turned out fabulous, Jess! I REALLY need to do this for my bedroom since I can never find panels that are just what I want since our ceilings are so tall! I love SO many of their fabrics, but the Richloom Birdwatcher Meadow is calling my name! I really like Joel Dewberry’s sparrow fabrics! I can’t pick a fave. That is like asking me to pick a favorite child. Ophelia blossom isn’t bad. it is on my top list. So is water bouquet and bliss bouquet. I love all the Premiere Prints!! Thanks for the chance to win! I love the fabric you used for your curtains. Love OnlineFabricStore too! So many fabric choices. …I love them all! Just the right amount of modern mixed with classic. I love all Of Amy Butler’s fabric.